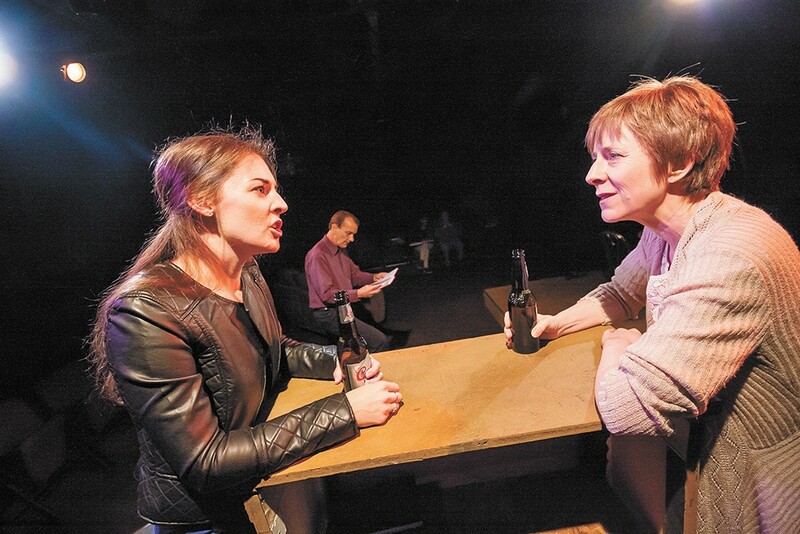 FROM LEFT: Aubrey Shimek Davis, Tom Heppler and Diana Trotter in the Civic's production of Fiction. The title of Steven Dietz's Fiction is misleadingly definitive. Given that the crux of this play is our most private selves and how much is truly knowable about anyone, it might be more fitting to call it Fiction? — with special emphasis on the question mark. A new production of Dietz's award-winning drama opens Friday, April 29, in the lower-level studio of the Spokane Civic Theatre. Directed by Susan Hardie (York), it features a minimal set and just three actors — Tom Heppler (Wittenberg, Equus), Aubrey Shimek Davis (All My Sons) and Diana Trotter (Wit, Other Desert Cities) — in an unconventional love triangle. Unconventional, that is, because there can be doubt in the minds of the characters, as well as the audience, about whether or not the triangle even exists. Trotter and Heppler play Linda and Michael Waterman, two married writers who've each found fame in different ways. Linda has one acclaimed novel to her name, whereas Michael's work lends itself to big-screen blockbusters. When Linda is confronted with her own mortality, the couple ends up exchanging diaries in what might be seen as the ultimate act of intimacy. In the pages of her husband's diary, Linda comes across paramour Abby Drake (Davis), an intern at a writer's retreat that Michael once attended. "His wife believes that what he's written is true because she knows his writing," Heppler says. Yet there's a possibility that Michael's relationship with Abby is the stuff of fantasy, a vicarious literary substitute for an actual affair. Or could that just be a clever defense from a professional storyteller? Along those same uncertain lines, both Trotter and Heppler are cautious about describing the thrust of Fiction in declarative statements. "What makes a life real? What do you believe and not believe?" Heppler asks rhetorically; Trotter echoes him: "What are the stories that we tell ourselves, and what's really true? Is it the facts? It is our perception of the facts? Or is it the way they feel? How do all those things play together? And what do we have a right to in each other's lives?" To illustrate that last point, Heppler quotes one of his character's lines: "A marriage, however good, is not a tell-all enterprise. It is a pact between necessary strangers." "This is a really human play, and it's fascinating," says Trotter. In an effort to accentuate that humanity and counter the play's reputation for cerebral dialogue, she says that the cast is focusing on bringing a greater sense of "naturalism" to the work. Along with Fiction's sudden shifts in time and tone, that could prove challenging, but Trotter says the cast has a strong handle of "this slippery thing that Dietz has created."